Yes. I am indeed mid-skip when this photo taken. I just thought I’d try it out. LOL! A for effort? Bonus points for trying? Anyone? Please? I just wanted to change things up a bit so that you wouldn’t get bored but okay, fine. Let’s stick to my standard blog poses, shall we? Anyway, here’s another outfit post to inspire those of who are thinking of joining the Forever 21 MasterCard Anniversary Photo Contest. I’ve already talked about this on my previous entry so you can read all about it there. Just to summarize, the contest is for BDO Forever21 MasterCard Credit Cardholders. Cardholders who join this contest get a chance to win me as their prize. I kid, I kid. Baka walang sumali! I, together with BDO and Forever 21 will choose 5 winners with the best outfit photos posted on www.forever21ph.com. These 5 winners will win P10,000 worth of Forever 21 items, a styling session with me and an exclusive invite to the Forever 21 SM Aura opening on May 16, 2013. 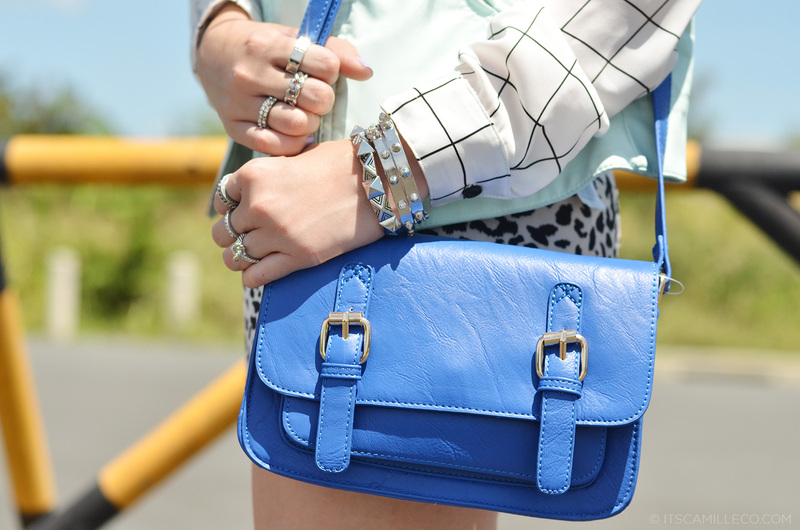 In my previous Forever 21 outfit post, I showed you my summer style in bright colors. For this outfit post, here’s something a bit more city chic. Now do you get why the title for this post is such? Aside from the obvious–the square shapes on my top and quilted vest, I also want to convey a simple message. When it comes to your style, don’t be afraid to be a square peg in a sea of round holes. Don’t be afraid to stand out! Show the whole world how unique you are! That’s how you’ll get noticed. Your style should be personal. It should speak for you. This is me. I love Forever 21 because I’m able to show how much I love mixing and matching different things and making them work in my own little way. For more info on the Forever 21 MasterCard Anniversary Photo Contest, click here. To my future 5 winners, I can’t wait to meet you at the Forever 21 SM Aura VIP opening on May 16, 2013. Forever 21 SM Aura opens to the public officially on May 17. I don’t remember! Maybe MAC Saint Germaine? Hi ma’am Camille your so pretty! Bakit Ma’am? Haha! Thanks Clau! Thanks Ajoy! My closet is not big enough! LOL! I like it when the time I comment is also the time you’re replying!!! Please Join Bb. Pilipinas! Oh noooooo! I do hope it gets processed soon! hi cams! can you help me improve my blog? your using blogspot right? i want my title to be nice like yours. i dont know how to make it better :”( help me pleaaase! i love your shorts!! :D <3 ahhhhhh!! try mo yung maka-punit-singit-split! haha! I’m sure magiging breakthrough blogger ka OF ALL TIME! wala pang nag-attempt nun! kabog sila fashiontoast, manrepeller, at chicmuse! Anyway I love your accessories! Especially the necklaces! Ako rin, I feel the same way. Nauubusan na ako ng pose haha! So I end up just standing there LOL :) Thanks KC! Love this look Ms. Camille. Pretty as always! May I ask you something? What’s the brand name of your facial moisturizer & toner? Great points to that mid-skip! More of fun pose :) Nice unique outfit ! The puppy dog eyes got me— ok ok i LOVE the skip shot! Lol oh come on Camille, you can do no wrong for your avid fans like me :) you’re awesome and I love the whole ensemble! The best legs sa balat ng blogosphere. Your legs look great in the first photo (but they always do in every post). What do you do to keep fit? Let me guess…no workout, just good genes? You are so lucky. Thanks Vermz! I started working out again a few months ago! :) Yay! I love the combination of the checkered top and leopard print shorts…great play on patterns! pasado daw kay Tyra Banks ung photo mo. Hahaha! nadala lang daw siya sa “puppy eyse” at “pout” mo. Without “puppy dog eyes” “sad pout” “begging”. You deserve an A for effort Miss Caaams! With bonus points pa! ;) Ikaw pa Ms Cams? Thank you for my dear crown haha! 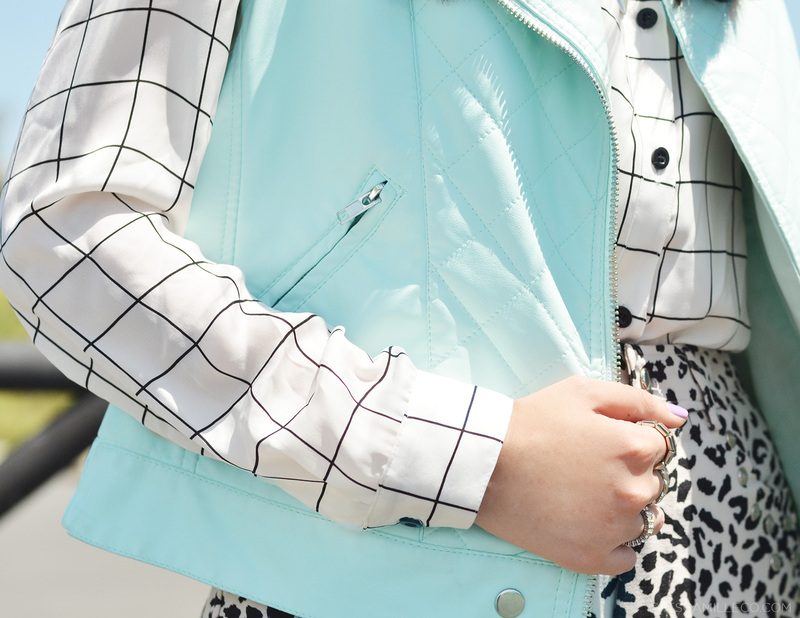 love that mint lether vest! Perfect! Join na the contest! great mix of prints !!! omg i really hate that i cannot join this contest huhuhuhu. :((( my parents won’t allow me to get a card </////3 anyways i'm happy to play #spotted camille co! haha! btw i won the BloggersUnitedthrowbacktuesday contest last night!! they picked my entry! i have a free pass now. excited to see you! Yay! See you again there! A for effort and output! :D Looking good! You even convinced me for a few seconds that it’s not summer and the sun’s not blazing hot nowadays, haha! I love the bag, very spring like. :) And you look gorgeous!